Our product range includes a wide range of ht metering cubicle. We supply HT Metering Cubicle up to 33KV where metering is done in 3 phase 4 wire system employing 3 current transformers and 3 voltage transformers. 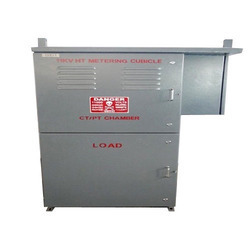 Primary HT Metering Cubicle, offered by us, consists of 4 compartments cable, incoming compartment, CTVT assembly compartment, cable outgoing compartment and meter compartment. All live parts inside the CTVT compartment and all secondary leads and joints are of epoxy resin so that the connection cannot be tampered at all. The primary winding of the AC Potential Transformer is connected in the parallel with a circuit where the voltage of the system is to be measured or controlled. The door of metering compartment is provided with non re-settable counter. We offer HT Metering Cubicle in various insulation levels that make us stand among the proficient HT HT Metering Cubicle Suppliers in India. Rated STC : Upto 13.1kA / 1 Sec.